BOSS Fire & Safety's full range of fire pillows are designed to fire rate wall and floor penetrations. BOSS Fire & Safety's full range of fire pillows are designed to fire rate wall and floor penetrations. The pillows are suited to environments where pipes, telecommunications cables, cable trays and service shafts penetrate a fire-rated wall or floor. When sealed with FireMastic-300, the fire pillow will maintain the integrity of a fire wall or floor. 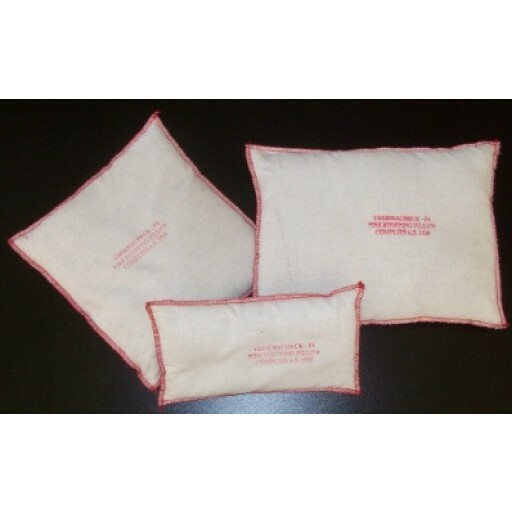 Our fire pillows have been tested and certified, fully compliant with AS1530.4-1997 and AS1407-1992. The pillows can be used to seal an opening in a floor or wall to a maximum width or height of 400mm by any practical length. The sealing of the pillows is achieved by 'pillow pressure' and the use of FireMastic-300 to fill in voids around various pipes, cables and penetrations. Pillows should be stacked tightly in the direction of the least span (up to 400mm) and restrained on the sides by wall section or pillows.